In 1867, at the age of 36, my great-great-grandfather by adoption debarked from a ship at New York and traveled west by train to St. Louis, Missouri. James Gurney had been a gardener at the Royal Botanic Gardens at Kew, responsible for breeding and growing Amazonian water lilies, including the famous Victoria, with pads large enough for a person to stand on and flowers of incomparable beauty--no mean feat in chilly England. He’d been selected to accompany a botanical expedition to Africa, but was unable to go. (This saved his life, since everyone on that trip died.) Instead, he headed to the US, where, once in St. Louis he got a job working for local philanthropist Henry Shaw, who had already established the Missouri Botanic Garden and was developing plans for the 280-acre Tower Grove Park to be located across the street. Gurney was his man, though accounts differ as to whether Shaw, an Englishman, hired him over from Kew, or Gurney, on his way to California and both short of funds and alarmed by reports of an epidemic out west, decided to stay put and look for work. At any rate, the two men met and got on well, so well that Gurney eventually became involved in nearly all aspects of planning, planting and later running both. Eventually he became superintendent of Tower Grove Park. Two more generations of Gurney subsequently served as superintendents, a long run that finally finished in 1978 when my great-aunt Bernice Gurney retired. To get to St. Louis, Gurney had several routes available to him; at that time a vast network of rail connections made it much easier to go anywhere in the Eastern US by train than it is today. He might have gone south to Cincinnati and then west to the Mississippi. Alternatively, he could have visited the rumbustious town of Chicago, only incorporated for thirty years and already a transportation hub and home to the great Lincoln Park on the lakefront. From there he would have taken the train south and west through farms, prairies and across rivers, stopping at the towns of Dwight, Pontiac, Bloomington, Springfield, Alton and East St. Louis. There being no bridge across the Mississippi, a constantly shifting third of a mile wide at that point, he and everyone else would have taken a ferry to get to St. Louis proper. In mid-July, I took that same route from Chicago to deliver to Tower Grove Park and the Missouri Botanic Garden some family papers and a few books on water gardening and water lilies that had belonged to Gurney. The train still runs that way, but the number of boxes required car travel. As my husband aimed our hybrid south on I-55, we passed through the same towns and the same topography. It is the landscape I’ve known my entire life, a landscape dominated by sky that people from other regions often dismiss as having no scenery, or describe as featureless: flat, under-populated, with vast, silent, unmoving fields in either of two shades of green denoting corn or soy, stretching to the horizon in all directions, only interrupted by a road or an occasional line or grove of trees such as oaks or maples. Everything looked so completely normal that as usual I turned to scanning the roadside verge, where there were, at intervals, things to be seen: a hawk sitting on top of a telephone pole or in a tree, or red-winged blackbirds starting up out of a roadside ditch full of cattails and invasive Phragmites reed. There’s a game I play, plant ID from a moving car or train. This time I looked for milkweed and wildflowers that bloom in mid to late summer: pollinator habitat. I was thinking particularly of the Eastern monarch butterfly, one of the most charismatic of insects, whose life cycle depends on having access to flowers for the nectar that sustains it and milkweed, where it lays its eggs and is the only plant the caterpillars can eat. There were patches; but mostly there were miles long stretches of mown grass or clusters of shrubs such as autumn olive. Sparse pickings for monarchs or any other pollinators. At Tower Grove, everything went swimmingly. My daughter had driven in from Kansas City, MO to meet us. An evening reception in the old Superintendent’s House on the grounds introduced us to a number of directors, park board commissioners, the archivist and others involved with the running of the Missouri Botanic Garden and Tower Grove. We enjoyed getting to know these people who care so deeply about this piece of land, which, true to Shaw’s and Gurney’s intentions, nearly a century and a half later still serves as a green refuge for a diverse urban population. The next morning, we had a private tour by golf cart with the development director. The weather was uncharacteristically cool for St. Louis in July—only in the mid 80’s. All kinds of folks were out walking their dogs, jogging, gathering for yoga, strolling the farmers market, playing tennis and pickle ball or simply sitting under the trees and enjoying the day. The park was designed with grand entrances and an enclosing border of trees and shrubs surrounding the more open center, to accentuate the feeling of being an oasis. It still has that effect, or even more so, since thousands of the trees that Gurney and his crew planted are now full-crowned elders looking out over the younger ones planted in all the years since. Though the park by and large hews to its original gardenesque, or formal, design, including Gurney’s lily ponds, relief is offered by several natural areas. Enlarging these areas has risen in priority in the last few years, and much time, planning and expense has been devoted to this endeavor. A bird sanctuary restoration has created space beneath the clustered trees for a native plant understory, a new path, a bench, and a burbling fountain, waterfall and pool reminiscent of something Jens Jensen might have had built. We stood quietly until the familiar birds of summer, including robins, a woodpecker, and a couple of chickadees and a nuthatch appeared, going about their business around the water and in the trees. Our guide proudly told us that it has become a favored spot for over a hundred species during spring and fall migration. Pollinator habitat also figures prominently. Near the sanctuary we passed a prairie area full of the tall flowers and grasses of midsummer, a riot of green, gold and bright yellow waving—almost sparkling—in the breeze under the bright blue sky and full of butterflies and bees. A Cooper’s hawk flew overhead. Equally gratifying were the banks of a stream covered over in the early 20th century, but now revealed and the edges planted with appropriate native vegetation, including purple cone flower, black-eyed Susan, butterfly weed, Liatris, and various sedges. Monarch and swallowtail butterflies and several species of native bumble and solitary bees foraged amidst the abundance. There is another covered stream on the grounds that they’d like to treat in the same way, and for which they are fundraising. As we toured, I began to love the place, and admit to feeling proud that my family was involved with its origins and subsequent administration. I liked even better how it is changing with the times. As European immigrants in what had been a slave state prior to the Civil War, Shaw’s and Gurney’s orientation was inevitably white and Eurocentric. Now, in the 21st century, in a metro area with an ongoing struggle with troubled race relations and segregation, it has not only lived up to their vision as a beautiful respite for city dwellers of all economic classes, but has gone beyond by embracing the increasing diversity of the surrounding neighborhoods, cultivating inclusivity in the activities and events it sponsors, and including the new commitment to ecosystem biodiversity and native plants in the landscape. That afternoon we started for home. The monotonous landscape seemed even emptier than before, highly controlled and formal in appearance as the most manicured upper middle class suburb or corporate campus—gardenesque to a kind of minimalist extreme. The lack of any kind of animal life, including humans doing work on the land, was striking, though normal for this middle period sandwiched between spring planting and spraying and fall harvest. As so many times in the past, I again realized, that, oh right, there should be color, riotous plant diversity, prairie flowers and grasses waving in the wind—what I had just seen in the city, and what folks, including Gurney, would have considered normal as they took their journeys between Chicago and St. Louis. Though they’ve apparently had a good summer this year, overall monarch populations have declined as much as 80% over the last twenty years due to threats to their overwintering sites in Mexico and extreme loss of spring and summer habitat, along with disease, predators, pesticide use and extreme weather events. When pollinator conservationists talk about loss of habitat in the US and Canada, they are mainly talking about these millions of monocropped, more or less ecologically non-functional acres that in replacing the prairies have come to define the Midwest. Not only have the flowers of summer gone missing, but crucially, gone too are the flowers of September, the late bonesets, asters and goldenrods in all their many species that power the long fall migration. While three short-lived generations during a given spring and summer make their way north, laying eggs along the way, the fourth generation that emerges in early fall lives for about eight months. When they mature, these butterflies don’t mate and lay eggs. Instead, each one embarks on the roughly 2,500 mile flight down to the Sierra Madre mountains to overwinter; that same generation then heads back north the next spring. It takes approximately four and a half hours to drive the 300 miles between Chicago and St. Louis at speeds in excess of 60 mph. A migrating monarch can fly between 40 and 100 miles a day if conditions are good and the winds are right. As we traveled in comfort I began to imagine how it would be to be a migrant impelled to take a long, risky journey through a desolate, perhaps war torn landscape, unable to carry food or supplies, exposed to all weathers, in constant danger of death, the project of reaching the next haven fraught with high odds of failure. And, once reached, would there be provision enough for my relatives and me to gather strength to continue the journey? For humans these days this is a terribly familiar, ongoing catastrophe. Amelioration would involve negotiating all the complexities of human societies and settling their manifold hostilities, which nearly guarantees that the means and the will are vanishingly small. However, for these small bright, creatures, each short-lived and evanescent in itself, but part of one of the greatest migrations on earth that encompasses all three nations of the North American continent, the answer is incredibly simple and achievable. There is enough land, more than enough land, throughout the Midwest (and beyond) to support monarchs and still grow more corn and soy than we need. There is enough land, along the highways, in the grassy green circles and triangles of interchanges, in yards and parks, on campuses, in vacant lots—anywhere, really—to grow a patch of three-season-blooming wildflowers, including milkweed. Doing so on large scale would help prevent a form of inter-species genocide that if completed would redound negatively forever, morally and ethically, on our own species—while also having serious biological ramifications. We are all complicit in this ongoing crisis and potential tragedy—those who grow the monocrops and those, even in other countries, who consume them, whether for animal feed or as food or other products such as biofuels or cosmetics; those who decide how often to mow and what should be allowed to grow on the roadsides; those who pass and enforce anti-weed ordinances outlawing native wildflowers and milkweed; those who develop and sell and use the herbicides that kill the plants on which the monarch depends; those that select their landscaping plants for color only while neglecting value to bees and butterflies; and those who don’t think about or don’t care about these things at all. All is not yet lost. Millions of individual gardeners are allowing milkweed to take hold in their gardens, while also planting the other flowers monarchs and other pollinators prefer—sometimes risking censure from their homeowners associations or even arrest and ticketing by their municipality. Grade schools are planting butterfly gardens. 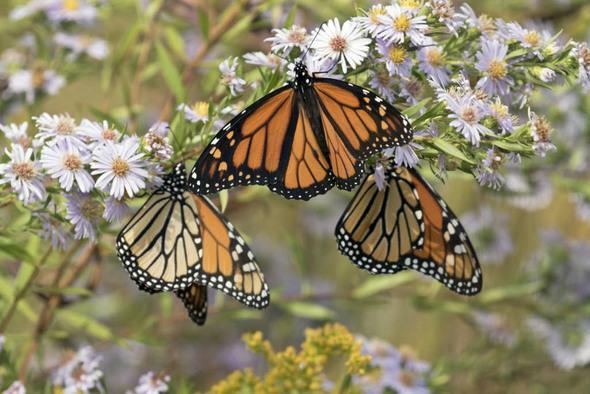 Park districts are making monarch conservation an important factor in how they landscape. A number of farmers in Quebec and Vermont have even turned to growing milkweed as a crop. the fine silk from milkweed pods being a good insulation material for coats and comforters. Other farmers and entities such as utility companies that control rights of way under power lines are changing their land management. And, groups such as Monarch Watch, Monarch Joint Venture, Journey North, Xerces, and Wild Ones are enabling and supporting the efforts of individuals and institutions to study, share knowledge, educate the public and create habitat. Even at policy level there is potential progress. The monarch is in review in the US for endangered species protection status, a fact that makes certain multi-national industrial agricultural corporations and conventional farming associations very nervous. (A decision has been legally mandated by June 2019.) States are creating monarch conservation plans and their legislatures are considering new laws. This year, for example, Illinois passed a law stating that large ground level solar installations should be landscaped with native plants and managed as pollinator habitat. Extensive research has shown that our Midwestern cities can and do provide good pollinator habitat. In Chicago and St. Louis, in Minneapolis, Madison and Kansas City, in Indianapolis and Des Moines, where we have pollinator friendly urban parks and natural areas, and our concerned citizens plant backyard pocket prairies, monitor and even raise monarchs, it’s easy to feel optimistic. But the question is, how soon, how fast can all the necessary steps be taken, and will they be enough in the face of, among other things, the increasingly dangerous vagaries of climate-change related extreme weather? When traversing the long, long miles between cities, especially as the monarch flies, optimism and even hope can begin to look like a luxury. The job of changing land use rules and methods so that maintaining and creating habitat would be common practice can seem an almost impossible task. Right now, during September and early October, in fact possibly right this minute as you are reading, the last monarchs are emerging that will make the journey south. Where are they finding the nourishment they need as they flutter over the fields, through towns and along roads? And which of us will decide this winter that come spring we’ll plant a container, a garden, or even a whole field to the kinds of flowers and grasses that once reigned across the Midwest? Just this past week a monarch emerged from a chrysalis hanging under the edge of the bottom step of my back porch. I watched it bask in the sun, stretching its wings until they were firm enough to support its weight. Then it flew, airborne for the first time. Tentative and slightly wobbly at first, with increasing strength it began foraging for its first meal among the prairie sunflowers, snakeroot, late boneset, goldenrod and asters, foraging for its first meal. A couple of days later it was gone. Would it survive that long journey south across the devastated landscape, perhaps stopping at Tower Grove Park before pushing on to Mexico? I do hope so. If all goes well, it’s just possible I’ll be seeing its descendants, come next summer when the common milkweed is in bloom. There are still family farms along the way, my in-law's among them. For decades now farmers have been urged to get big or get out, to not leave any of their land unplowed. I watched in dismay as they drained the wet areas and removed the fencerows that had always been a haven of trees and "weeds", the nectar plants you describe here. They did it because they felt they had no choice if they wanted to survive. These farms are beginning to roll over to the next generation. I have hope that younger folk coming up will reinstate these fencerows and maybe even leave a little water standing. Farming in general probably needs to change anyway. These genetically modified and chemically doused grains aren't good for us any more than they are good for the land. People need to start taking back responsibility for growing the food they eat. As you pointed out, these mega-farms are not a sustainable way for our country to go. thanks for your comment. I know what you mean. It really has been hard for farmers faced with these choices. Farming is changing, slowly but surely, and I share your hope that younger farmers will incorporate more sustainable practices. Every state has farmers' groups such as the Practical Farmers of Iowa and the Illinois Stewardship Alliance that are working to improve farm practices. I'm with you on fencerows! Good post regarding the need for Monarch habitat. I would like to think that progress is being made and that it has something to do with this summer's more numerous Monarch sightings. The idea of Milkweed as a cash crop is exciting. As you say, though, too many people forget about fall-flowering plants. We need more asters and goldenrod, heleniums, sunflowers etc!